The block is made of 3/4 inch by 3 inch wide by 5 1/ 2 inch teak or mahogany. A 2 1/2 inch hole is drilled through it. The hole center is about 3 inches in from one end of the block. That same curve of the hole is then cut around the end of the block, making one end round. Next take the block to the boat and locate above the shelf where it will be located on the ceiling. Lightly outline the position in pencil, so you can keep coming back to the same spot. Holding the block to the ceiling, scribe the curve of the ceiling that must be belt sanded into the back of the block. Keep sanding and fitting till it fits the ceiling perfectly. Now have someone hold the block in place, have shelf in place and slide arm between shelf and ceiling block. This is possible because the arm is made up of two straight stanchion bases and SS tubing, the tubing is cut shorter and slides up each base without coming out. This lets you slide the arm assembly between the shelf and the ceiling block. With the arm assembly pushed up against the ceiling block you can measure the angle that has to be cut into the block to make a nice fit. With a hand saw cut this angle into the block. Fit again and see if any more modifications. I routed a radius around the block at the light area to finish of the block. Outline where the arm stanchion sits on the block. Mark the four stanchion mounting hole locations and the center of the arm SS pipe. Drill a 1/2 inch hole at the center to run the wire in. You will notice that on the back of the block you must also cut a trench to run the wire to the back of the light. Also drill clearance holes through the block for the four ceiling mounting screws. The screws that go through the stanchion are the screws that hold the block to the ceiling. Fit back to ceiling and mark these four mounting holes in the ceiling. Remove the block and drill proper fitting holes for the screws. 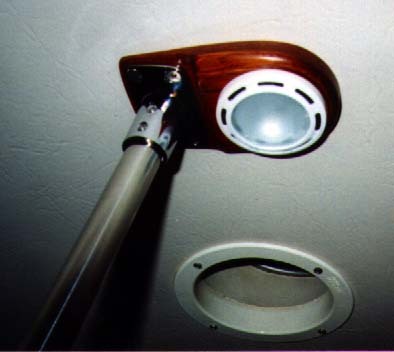 I played it safe and drilled into the fiberglass ceiling only 3/8 inch. With four screws that is plenty of holding area. Note that you will have to get two different size screws because of the angle of the block. I even sanded the tips off the screws to keep from hitting the top of my drilled holes. I did not want to risk going though the fiberglass. Our 26" by 10" wide shelf over the counter stopping short of the sink. 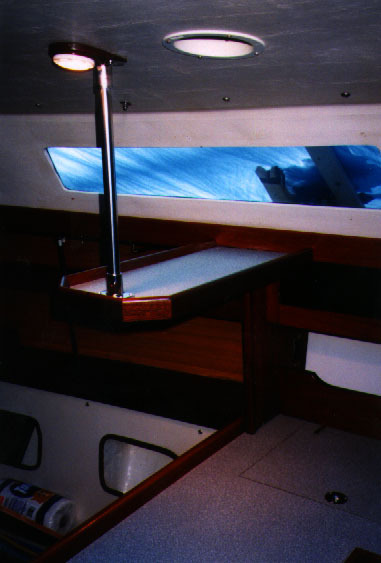 This shelf has a stainless bar supporting or hanging the end of the shelf from the cabin roof.